As Polar ice caps melt, a gang of sharks can reach Santa's workshop for the first time. Ho-Ho-Uh-Oh! It's SHARKMAS EVE. Zero gravity gets scary when a satellite filled with sharks collides with the 1st commercial space flight in SHARKELLITE. Dim sum diners, beware: That shark fin soup is out for revenge, in SHARK SIU BAO. In a desperate attempt to save a dying bee colony, a scientist combines shark and bee DNA. Then things get stingy in SHARK HIVE. Zombie sharks are hungry for brains in THE SHARKING DEAD. Ghost sharks are real and terrorizing you in PARANORMAL SHARKTIVITY. I don't have a logline for this yet, only a title: SHARKA KHAN. Let me rock you, Sharka Khan. Hipster roomies in Silver Lake breed sharks ironically. Nothing ironic about what the sharks do next. It's DEATH CAB FOR SHARKIE. Remember the "Supermoon"? It has nothing on SHARKMOON. An man climbs the summit of unexplored mountain in Nepal, only to find out sharks got there first in MT. SHARKEREST. At long last, the Titanic 2 replica ship embarks on its maiden voyage. But this time, icebergs aren't the danger. SHARKTANIC. An egotistical shark plays spoiler in the presidential campaign, throwing the US into a Constitutional crisis. It's SHARKNADER. War is imminent after Russia aims nuclear-powered sharks at North Atlantic Treaty Organization countries. It's SHARKNATO. 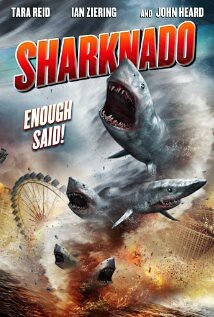 And finally, the bonus round: "Sharkolate Rain," "Sharkcano," "Sharkrifice," "Sharkquille O'Neal in Sharkazaam!"